Our 2011 Toyota 4Runner SR5 4X2 presented in Blizzard Pearl will take you to new heights. Motivated by a 4.0 Liter V6 offering 270hp connected to a 5 Speed Automatic transmission. Whether you're tackling trails or gliding through the carpool lane, this athletic Rear Wheel Drive SUV handles with precision and control and, it scores near 23mpg. One of the last true body-on-frames out there, its delivery of rugged off-road capabilities pairs with a smooth, unassuming ride. The 4Runner SR5 interior is refreshingly functional. You'll appreciate the clear instrumentation with large buttons and rotary knobs for climate and audio controls. The 8 speaker CD player with MP3/WMA playback capability gives you the ability to enjoy music from any decade. The large center console has an available 120V AC power outlet to run your laptop. In the rear, a 40/20/40 split seat offers versatility and also reclines for additional comfort. Amazingly, the rear window actually opens; great for ventilation and loading groceries! Whatever your adventure, you'll be prepared and safe thanks to Toyota's anti-lock brakes, the STAR safety system, hill start assist control, and an army of airbags ensure it. You can load it up with gear, put a bike rack on the back, put a cargo box up on the rack, tow your trailer and still seat five comfortably. Print this page and call us Now... We Know You Will Enjoy Your Test Drive Towards Ownership! Please call us for more information. 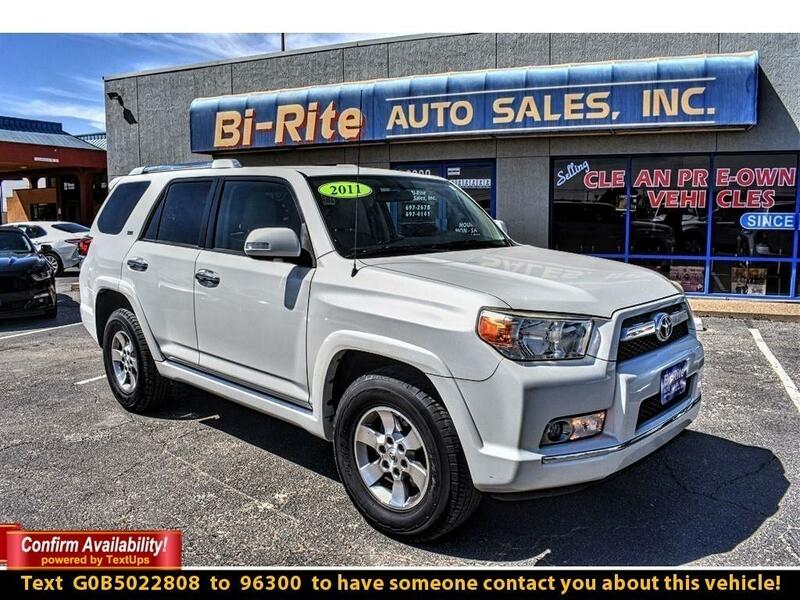 Message: Thought you might be interested in this 2011 Toyota 4Runner.